I suppose it’s more apropos to look back over the year on December 31st. but what the hay, we were too busy having fun yesterday! Today, the very first day of 2015, seems like the perfect opportunity with the fire crackling merrily and the weather running amok. I’ve been told that in certain areas around the North Pole compass needles spin erratically and that would equally well describe today’s conditions. One minute a brilliant sun gives the waves a blindingly bright sparkle and next minute the horizon line and yes, the waves themselves, are totally obscured by intense snow squalls. The sky is a patchwork of Cerulean blue and various shades of grey, morphing into the deepest foreboding of charcoal. Add to this a staccato of ice pellets and surely it’s not hard to sympathize with our decision to postpone the first beach walk of this wonderful New Year. The dog does not agree. Not a single bone in sight. Juno is underwhelmed! 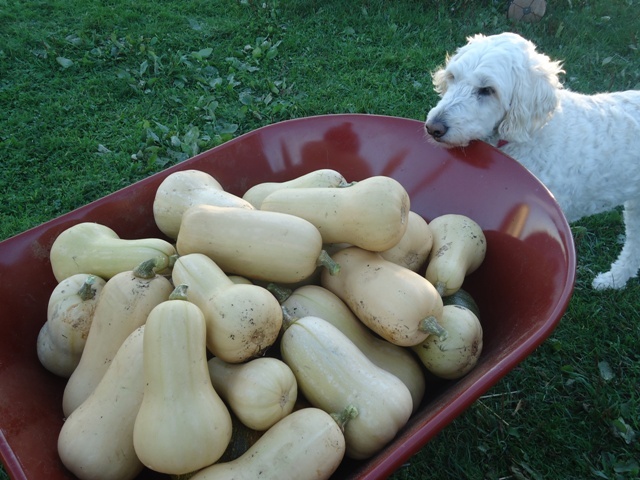 As shown Dog was also not particularly impressed by the butternut squash harvest. But we were. Ginger squash soup on a cold day takes some beating. 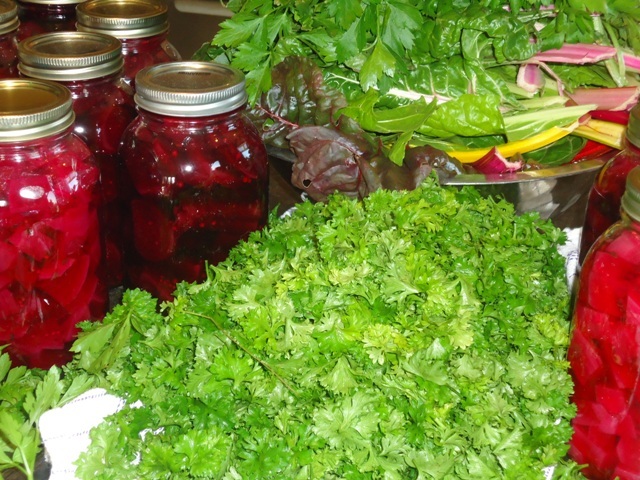 One of the things I concentrated on this year past was conserving as much of the food we grew as possible. This has always been my weakest area. The very late frost in 2014 helped me catch up and I don’t think we lost anything. I still have some leeks and Brussels Sprouts outside, well mulched, but also an equal amount in the basement. The leeks, both inside and out, seem equally happy but I think I harvested the sprouts a little too early and it wasn’t to their advantage. They still tasted delicious with Christmas dinner! The collard greens I left outside are also thriving but after this, our first really cold spell, I’m not sure how they’ll do. It’s the first time I’ve grown collards so am still on a learning curve with them. Will definitely grow them again. Looking back it’s fun to reassess the new things we tried in 2014. 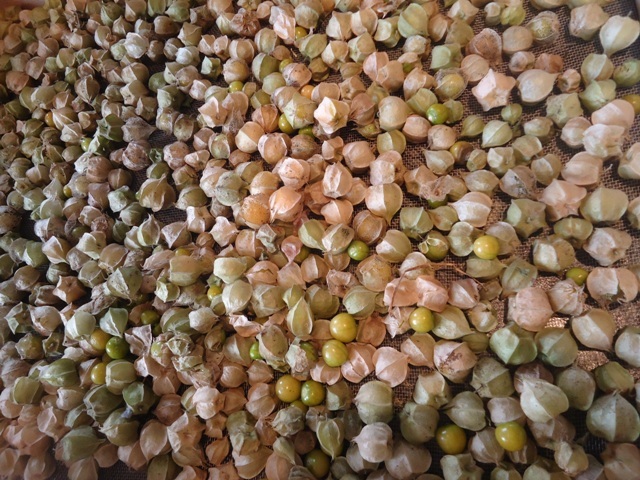 The ground cherries were a great hit and after eating them daily for at least six weeks we still harvested several bowls full in late Fall. They are not ripening well and seem to be in limbo so I’m going to experiment substituting them in a couple of tomatillo recipes. Other newbie faves are the Jerusalem Artichokes. 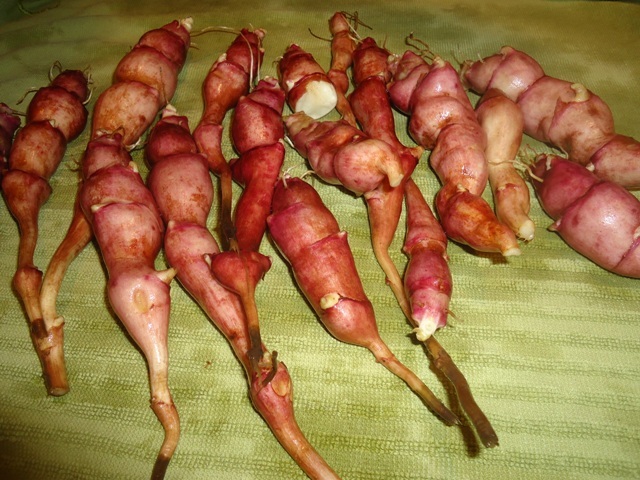 They might look a little weird but these Jerusalem Artichoke tubers were delicious when lightly roasted. We couldn’t wait until Spring and had to harvest some early for a taste test. Yummy! Much more appetizing than they look. They do need care when cooking so as not to overcook but otherwise are very versatile. And of course any mention of these great little plants must include a shout out for their flowers which brighten up the late Fall when many other flowers have faded away. These happy-faced blooms would be welcome in their own right but how wonderful that they are simply a by-product of some prolific, tasty little tubers. And while on the subject of flowers: I was reminded of one very important Permaculture principle this Summer when I tried to create a garden in memory of my mother. 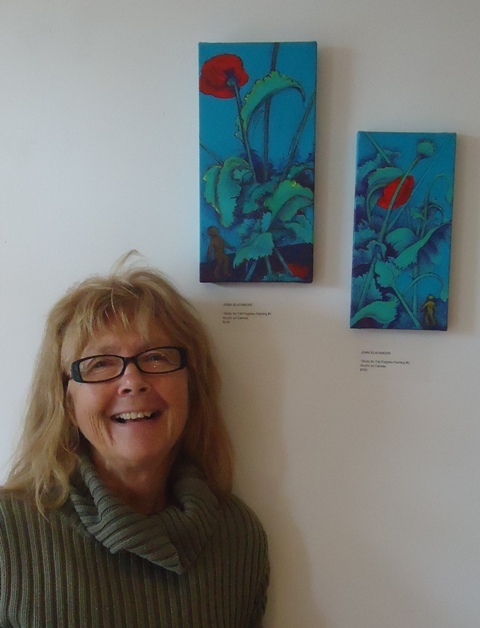 Her favorite flowers were Fuchsia and Anemones and I thought it would be nice to have some growing here at QuackaDoodle. I bought a selection of what I trusted to be reliable corms and planted them in a giant pot by the yoga deck. I was really excited with this idea and waited patiently… and then less patiently… until finally giving up in disgust. Not a single shoot of either Fuchsia or Anemone appeared. Disappointed! This pot of candytuft self-seeded from a previous year just to remind me that Mother N. really does know best. But look what happened. It seemed that Mother N. was really trying to stress the point that she really doesn’t need any help to produce a wonderful floral display with hardy, self proliferating plants suited to this location. 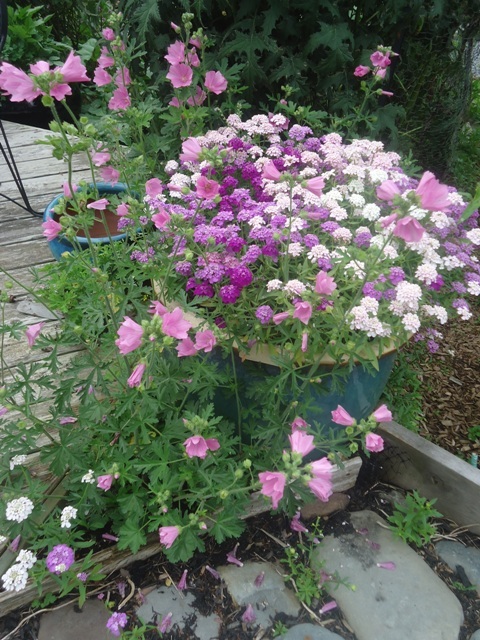 The pot was overfilled with candytuft that had reseeded itself from a previous year’s planting and surrounded by pink mallow that grows wherever it’s allowed to. 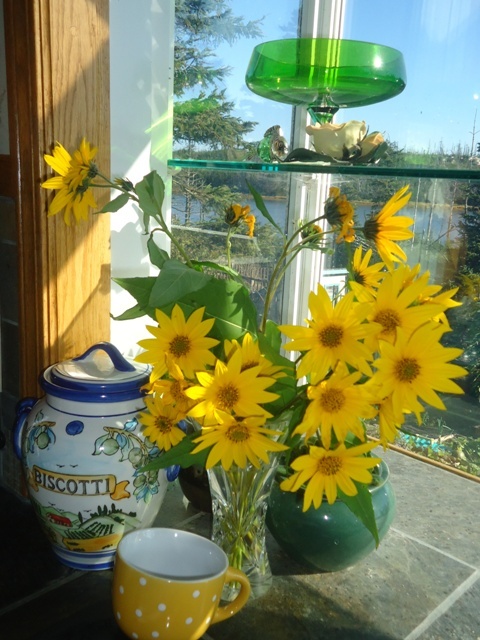 This display delighted all summer long, was cut back and bloomed again well into the Fall. With a little tidying in the Spring this fedge will serve well keeping the geese out of my lower veggie plot for many years. It’s also a good encouragement to experiment and try new things. 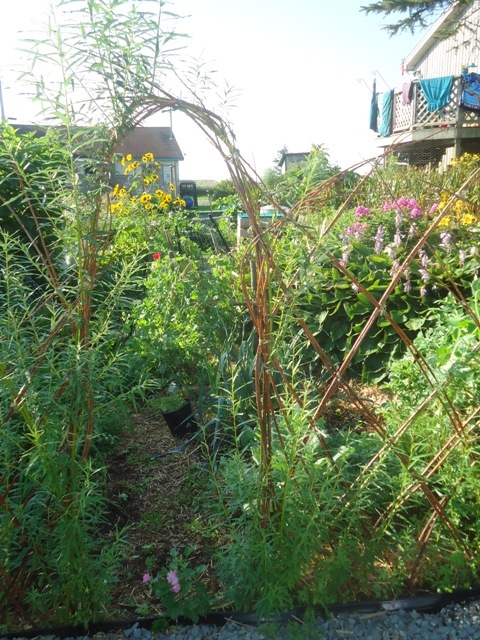 One new technique I tried in 2014 was ‘fedging’ or building living fences. It was rather a miserable process at the time because of the unseasonably cold weather and the fact that I really didn’t have much of an idea of what I was doing. I’m pleased to report that my attempts were successful and we now have living fences in several places, plus a copse of willow for future use. Sure it was hard work but it was worth it. 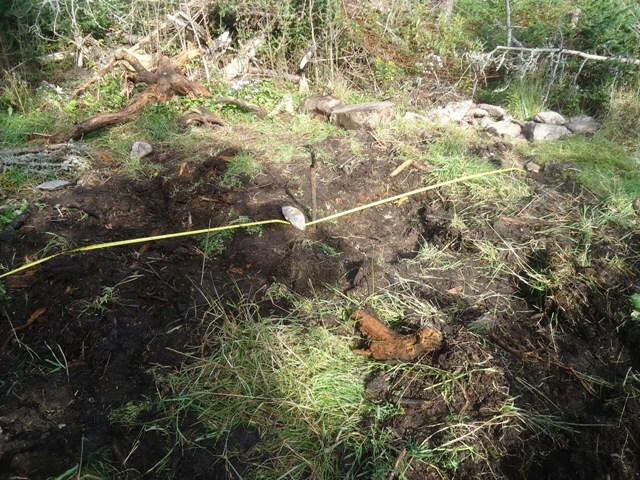 And talking of hard work, well let’s not forget the food forest development, stage one. If we had a forest I’d be simply inserting edible plants to create functional stacks and gradually replacing existing non-edibles with food producers. However, as all our trees were levelled by the hurricane I’m starting from scratch, trying to the best of my ability to construct guilds of edible plants which will support each other with little to no maintenance and gradually recreate the semblance of naturally evolving forest. Very ambitious I know, but given how far we’ve come and how wonderfully nature takes over when given the correct conditions and a little encouragement, I am hopeful and no doubt many of the blogs coming up in 2015 will catalogue progress. Hopefully this image of it’s very humble beginnings will seem less unrealistically optimistic over time. The science of forest development, especially as it relates to guilds and also fungi is truly fascinating, even to my totally unscientific way of thinking. I’m sure that the more any gardener knows about such things, the more successful they will be, working in harmony with the natural world. Hugel culture is a perfect example of this kind of understanding at work in the garden. 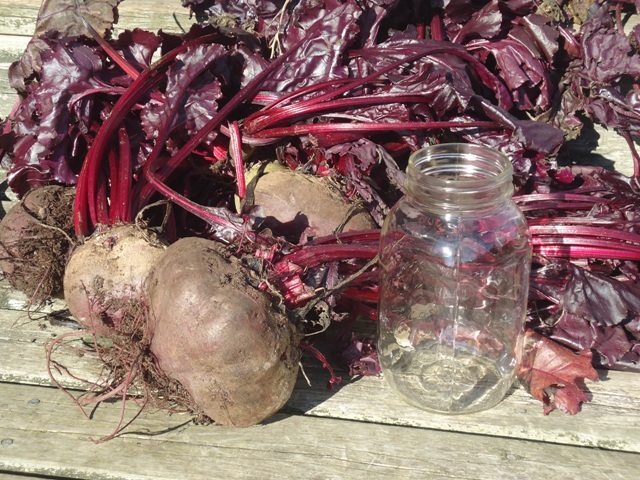 These giant beets flourished in a hugel bed and were not in the least bit woody, but how to fit them in the jar ??? These giant beets flourished in one of the hugel beds and surprisingly were not in the least bit woody or tough. I was able to elaborate on this method in a letter printed in the Fall edition of Permaculture magazine. I also have an article in the Winter edition of Permaculture magazine titled, The Heart Zone Rules. In this I examine the importance of intent, conviction and fulfilment as related to the various zones in any Permaculture plan. I could go on and on, remembering what a wonderful year it was here on QuackaDoodle but enough. In closing I’d like to wish all my blog followers and fellow permies an equally wonderful year in 2015. May all your poppies grow tall and fill your hearts with joy!